Officially, Broadies are people who have graduated from the Broad Academy, a training institute for educational leadership run by the Broad Foundation. penelope bly uses the term Broadies loosely, as a quick reference to all education reformers enamored by, and working closely with the Broad Foundation. To learn more about Broad-led education reform, visit Seattle Education, a blog that provides measured, well researched information about the Broad Foundation network. The following are some highlights, based on information taken from Broadies’ written goals, policies, public statements and private emails that were made public. The Broad Foundation believes that “education is a right, not a privilege, and no student should be left out, written off or ignored.” It strives to “ensure that every student in an urban public school has the opportunity to succeed.” Not many people would argue with this mission, and Broadie reformers appear passionate in their desire to carry it out. The very serious — many say disturbing — problem is in the Broadie approach and track record. He believes schools should be treated like an industry, and Broadies apply a market-driven, corporate model. Eli Broad and others state publicly that people with MBAs and law degrees need to run schools, regardless of any educational background. There is a push to outsource and privatize all educational services and programs, whether through non-profit organizations or for-profit companies. Its original goal was to take over failing inner city schools. It is now branching out to middle class, suburban communities with reasonably well-functioning districts. Their presence is strong in New York and New Jersey, where Broadies have been placed in top policy-making positions. Schools — public or charter — are expected to fit the plan, not vice versa. If they do poorly after following it, the teachers and school administrators are blamed, not the plan. Eventually they are fired, or the schools are closed down. Broadies from the Academy are trained to use what Eli Broad dubbed “investing in a disruptive force.” They continually reorganize, fire staff, pit schools and districts against each other, and experiment to create chaos or “churn.” The goal is to weaken the ability of communities to resist the change Broadies want to make. Therefore, Broadie leadership will frequently talk about partnering with communities, and will tag the word “partnership” onto titles and names of committees. But their actions usually show quite the opposite. 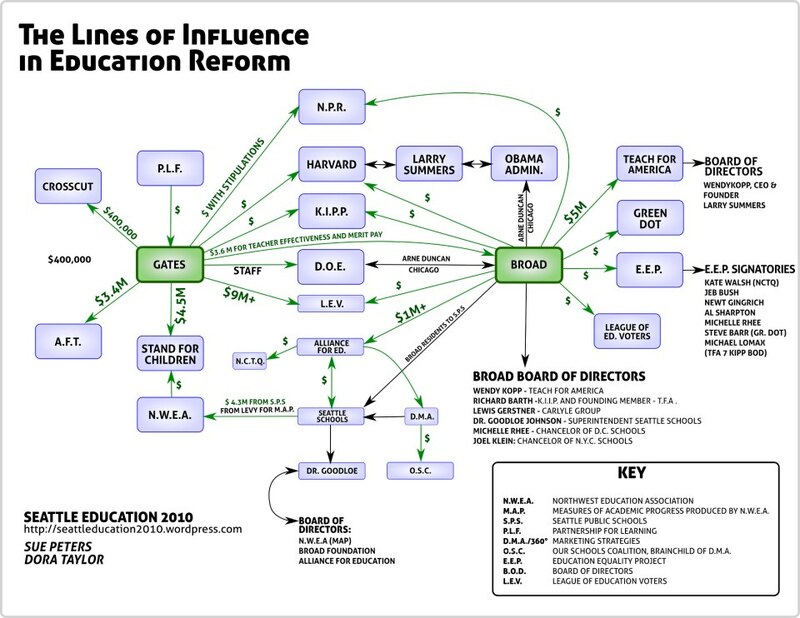 In fact, Broadies seem to operate on the belief that education reform requires infiltration and takeover. They are sometimes likened to colonizers, even by a few Broadies. A lot of military language is used — “pipeline” “coalescing forces” “advancing on the ground” “disruptive force” “unique capabilities” “central command” “readiness” “tightly aligned” and so on. Military-like, “psych-op” techniques are used to win support from the community. For instance, Broadies often install “astro-turf” advocacy groups so that a cry for, and support of, Broad leadership seems to spring up overnight in a community that had barely heard of them. Supporters may be sincere, but sometimes the groups are actually run by PR consultants. A common psych-op technique used is the creation of urgency. Parents and teachers are told there is no time for explanation, debate or program piloting because changes must happen right away. Otherwise the school district will be out of compliance with one thing or another, and be in big trouble. People who question, challenge or disagree are treated like opposition and resistance, and the psych-op technique of “splitting” is used against them. With splitting, rather than engage in debate or answer criticism, Broadies work to convince the rest of the community that the “opposition” is against them, not the Broad leadership, whereas the Broad leadership is has their back. As a private Foundation in partnership with other private organizations and busineses, it has minimal accountability to governments and communities. Broadie leaders consider such accountability a hindrance and work to limit in a variety of ways. Within several months, Broadie Chris Cerf was made Director of NJ’s Department of Education, and Broadie Penny McCormack was quietly hired as Montclair’s Superintendent. McCormack’s hire was so quick she did not have time to obtain NJ certification. It is important for Montclair residents to note: Ray and Associates, the executive search consultants who placed Penny McCormack as Montclair’s Superintendent, work at the Broad Academy. They advise and prepare Broad trainees for job searches. In 2013, after residents complained, Montclair’s school board formally stated that Ray and Associates had no ties to Broad Academy, despite the fact the Broad Academy listed them on their website as trainers and consultants. The link showing this has since been taken down. As a stated strategy, the Foundation targets communities where residents have little or no authority over how districts are run, or school boards have no say over whether charter schools are opened. Broadies particularly dislike unions, and vilify them as the cause of discord and budget shortfalls. In fact, the dislike mostly comes from the fact that unions lessen their control over a district. Eli Broad proudly describes this entire approach as the reason for his business success, and it’s true he has been extremely successful. He is a self-made billionaire. When applied to education reform, his approach has been DISMAL and disturbing. Districts have been left with astounding deficits of up to $40 million; organizational disarray; legal tangles; resources and assets sucked out of the community; a shortage of any teaching staff much less an experienced one; and charter schools that produce no academic improvement yet cost districts more than public schools. There are a number of cases of corruption and falsifying test results. Even inner city school districts that started out crazy with chaos have ended up worse under Broadie control. Broadies want to help the communities they take over, but as in the business world, a “venture” approach ends up benefiting the “investors.” Broad partnerships are pretty incestuous, arguably to the point of conflict of interest. For example, Broad-led school districts often contract with KIPP Charter Schools to open schools. KIPP schools often hire teachers from Teach for America. As it turns out, the CEO of KIPP and the founder of Teach for America sit on the Broad Academy and Broad Center boards. It’s important to note, many of us picture charter schools like they used to be — small grassroots schools run by communities in partnership with school boards. Charter schools are now chains or franchises, some non-profit, others for-profit. They are run corporate-style through central offices removed from the communities they serve. It’s also important to note: Many of us picture Teach for America as it was when it started 25 or so years ago — a peace corps style program where college graduates committed 2-3 years to teaching in failing, poverty-stricken inner city schools, under the supervision of experienced teachers. It has morphed into a large supplier of charter school teachers who are given five to ten weeks of teacher training and full responsibility of classrooms. They are also used in public school to replace (not support) experienced teachers. They are paid very little and the turnover is very high.